Back to Sea Salt, this time for lunch. Started with some cold items, Hawaiian Blue Prawns, Kumamoto, Kushi (? ), and Luna Oysters. 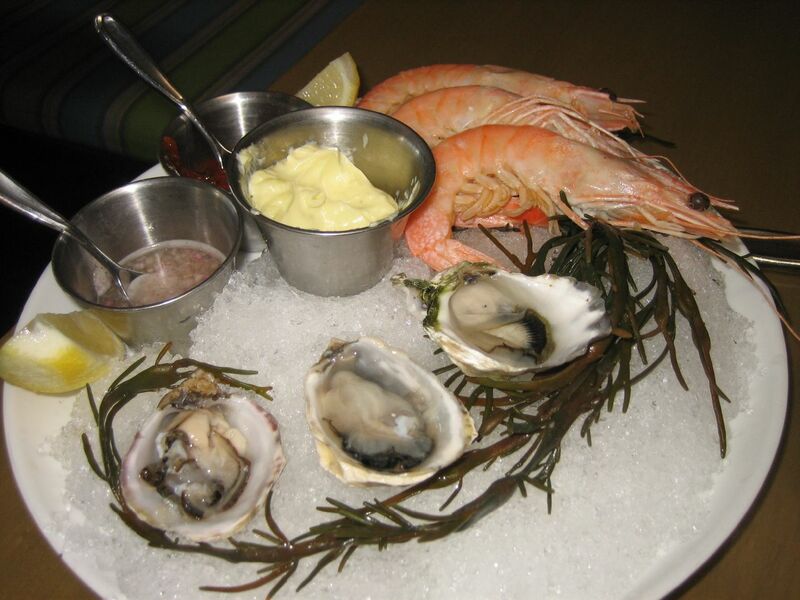 The Kumamoto had a lightly sea flavored brine with a sweet finish, the kushi had a very salty brine and a creamy texture a little more substantial than the kumi, the luna was creamy and had a neutral brine taste. The kumamotos are still my favorite. The prawns were fresh and cooked well and chilled. A good start. For our mains we tried the BLT (bacon lettuce and trout) sandwich and the salmon and goat cheese terrine. 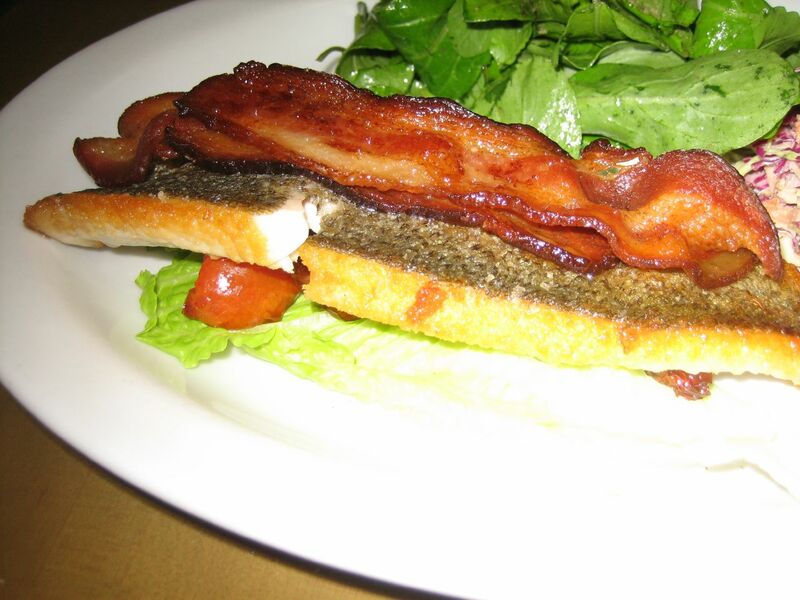 The trout was pan fried with a nice crispy skin, full trout flavor and topped with two slices of smokey bacon. The portion was substantial even without bread. The accompanying greens were fine, but the coleslaw was a little disappointing. The slaw did not have much flavor and lacked crunchiness. This is something to order again just for the delicious trout. 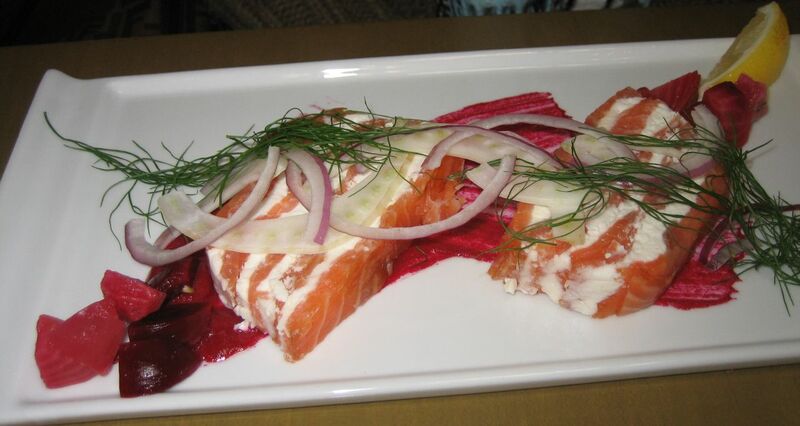 The terrine of salmon and goat cheese was also disappointing. The smoked salmon was good, but served too cold to show off salmon flavor. The amount of goat cheese was a bit overwhelming and overall the texture of the dish was soft and mushy, it could've done better with a crunchy starch element. Service was fine and the restaurant is comfortable, light and airy. After an excellent dinner at there, it was nice to find that it also worked well for a casual lunch. I'll definitely return to sample more of the interesting lunch offerings.